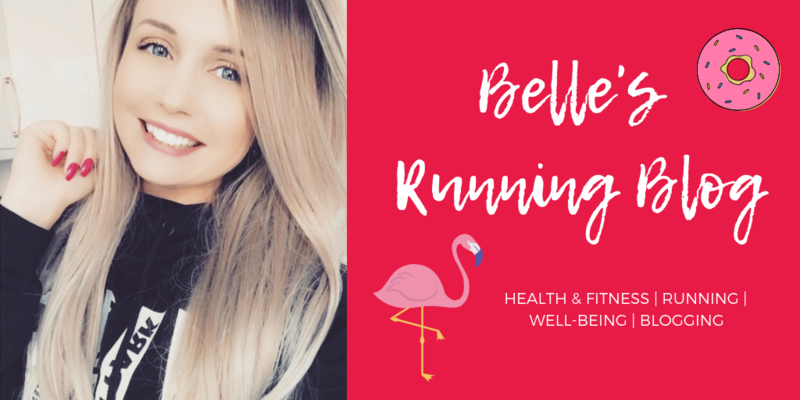 Spring has officially sprung here at Belle’s Running Blog! The weather is not as rainy in the ole UK and the sun has even dared to come out more often than not which means it’s perfect running weather. Not too hot not too cold! The Goldilocks of weather if you will. I haven’t got many races set up for the 2019 race calendar yet so I need to change that! But here’s what I ran in March and I’ll even throw in a couple of races to boot. I had 2 races this month both of which were really great and I’m keen to add them to next year’s race calendar! Not a huge amount of mileage this month but I have stepped up my workout game as I have an event in a few months that I want to be in top shape for! I did this race last year and managed a time of 1:05 but knowing I wasn’t in the best shape, I set the pacer on my Garmin Fenix 5s with a time of 59 minutes and hoped to get as close to this as I could. It was super windy across the course and I’d forgotten just how hilly it actually was! I battled all the way to the finish line but knew I was VERY far behind my planned under 1 hour time. 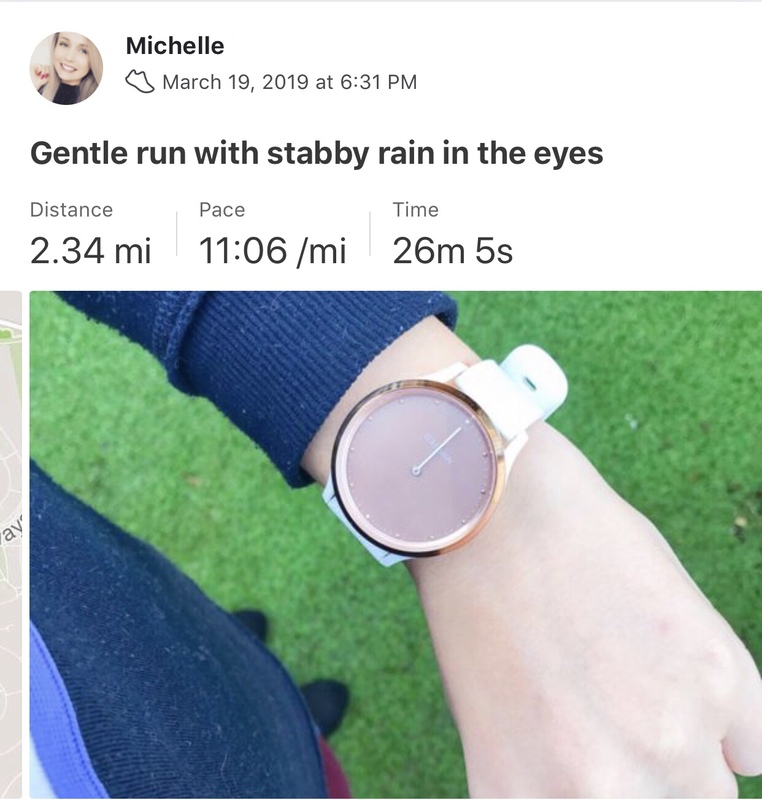 I’d taken a glance at my watch around 3 miles in and saw that I was already 6 minutes behind my pace time and there was no way I was going to be able to make that up! To say that I was disappointed with a finish time of 1:13 this year is an understatement! I knew I’d dropped off my fitness levels a little bit but I hadn’t realised how much. 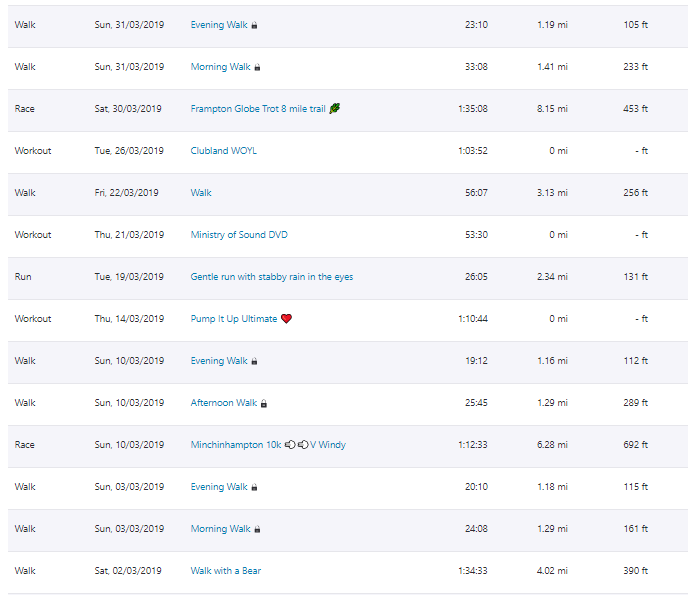 It made me realise that I’m going to have to seriously up my game this year if I want to get course PBs at some of the races I’ve signed up for already. IN FACT, it’s my WORST RACE EVER! This is including being ill in bed for nearly a month at the start of 2017 and doing zero exercise and then running the Longleat 10k! 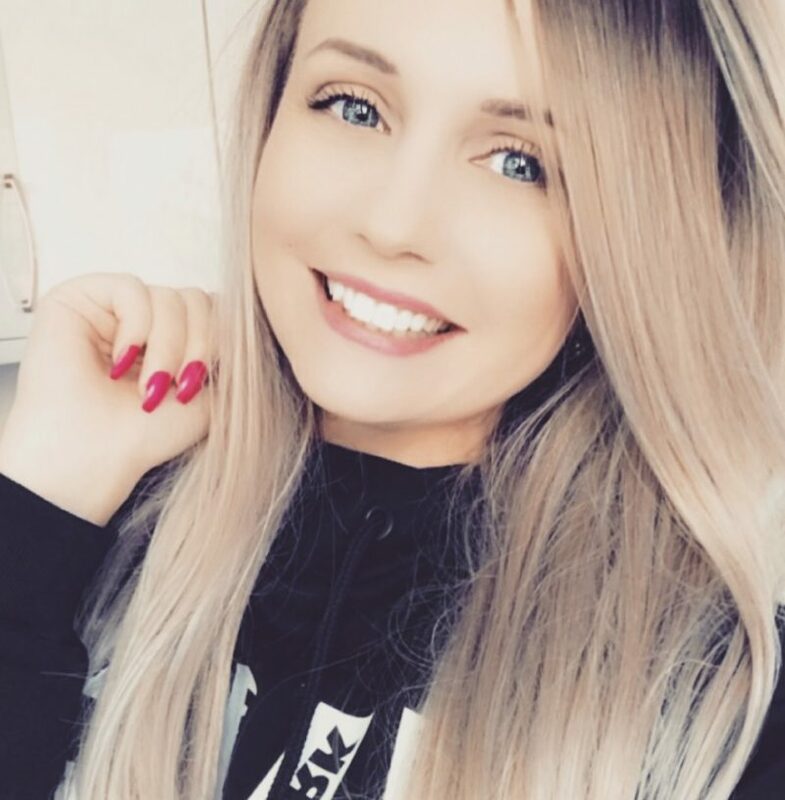 How could I have become such a terrible runner in such a short space of time?? Only one thing for it… train MORE! Only one run this month that wasn’t a race as I’ve been focusing more on my ‘indoor cardio’ workouts because the weather hasn’t been all that great. This run I fondly named ‘stabby rain in the eyes’ so no-one can accuse me of being a fair weather runner! I didn’t exactly redeem myself on this run after my terrible Minch experience. I’d missed out on this race last year so I was eagerly awaiting the entries to open online so I could enter this year. It was one of the best races I’ve done but it was really tough. The route takes you out around my old running stomping ground which is mostly around country lanes and fields. I didn’t really go in with a time in mind but I thought it would be swell if I managed to do it in around 1:30 (aside from the fact that it’s been A LOOONNNNNGGGGGG time since I ran as far as 8 miles and certainly not on trails). The day started off very misty but the cloud soon got burnt off by the sun and by the end of the race the sun was out in full (spring) force and it was pretty warm out there. 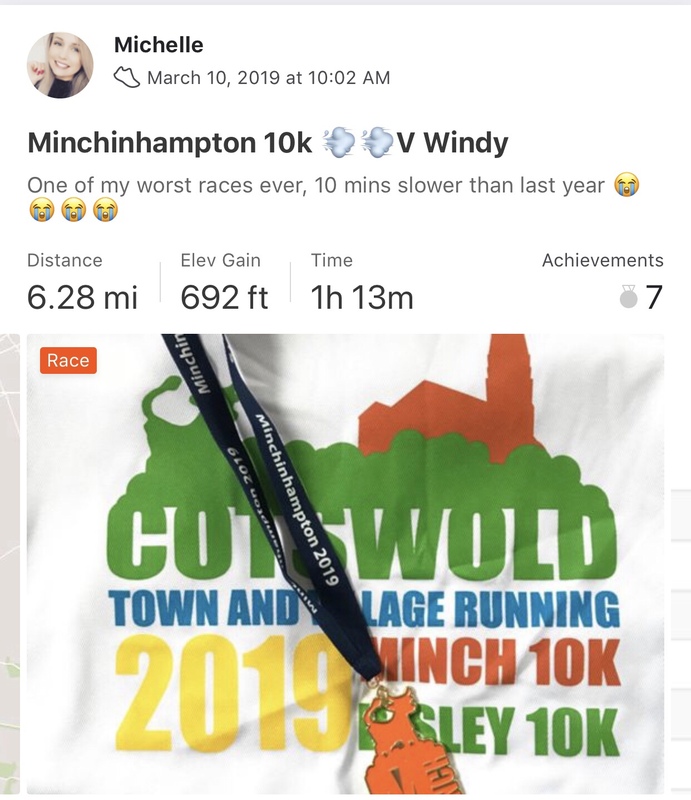 I really enjoyed this race and I’d be very interested in taking part again next year and I’d hope I’d be able to smash my 2019 time! 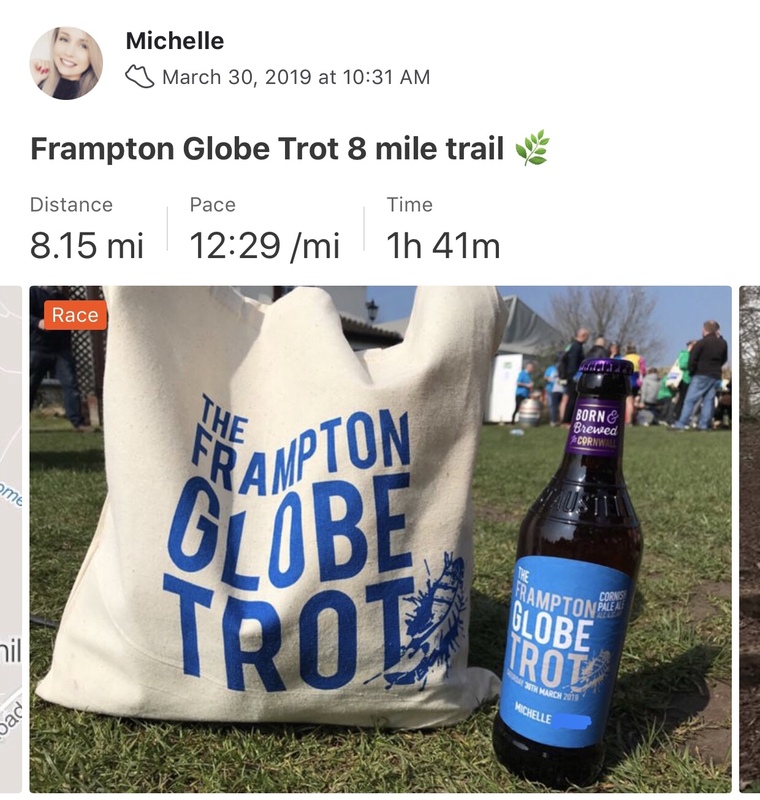 There was no finishers medal but you did get a bottle of ale with your name on and a Frampton Globe Trot t-shirt. I was pretty pleased with my effort even if it was a slow-ish time, I put everything I had into the race and I can’t ask myself for more than that. Other than my running (or lack of) in March, I did a good 3 cardio sessions with strength training. 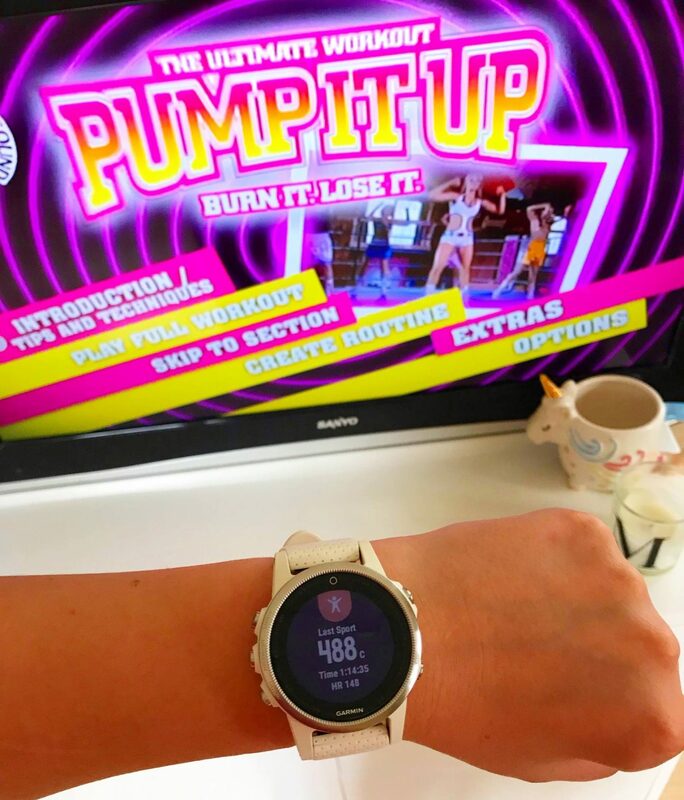 Because I hadn’t done them in so long (I also found a renewed love of Ministry of Sound’s Pump it Up Burn It Lose It workout DVD. This is a boxing-style workout DVD but it sure it a tough cardio workout and the strength training is no walk in the park either (I mean one reason I only did 3 runs and 3 cardio sessions is because they were all so tough I need long breaks in between them!). I’m a total cardio junkie so sweating up those calories is my all time favourite kind of workout. That’s it for March. I’ve got 2 great races coming up in April so I can’t wait to get on the courses and see what I can do. 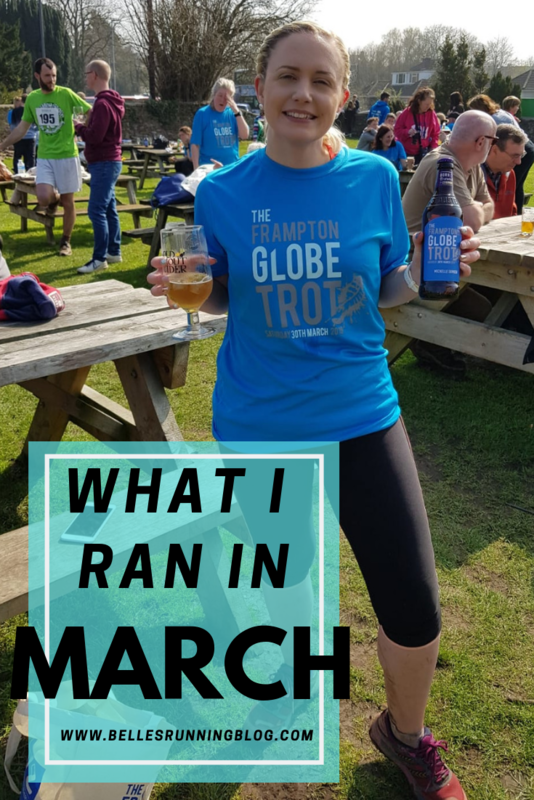 What did you run in March?